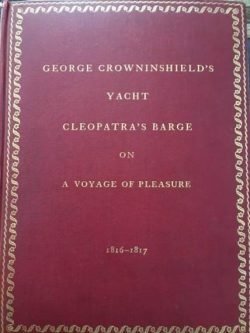 The Story of George Crowninshield’s Yacht Cleopatra’s Barge – On a Voyage of Pleasure to the Western Island and the Mediterranean 1816-1817. Compiled from Journals, Letters and Log-Book by Francis B. Crowninshield. Boston, Privately Printed, 1913. Original red cloth, gilt paneling to the boards, title gilt to upper board and spine, top edge gilt. Photogravure frontispiece and 38 similar plates, plans and facsimiles, 5 of them folding, one of these double sided. Some marginal foxing, but overall Very Good. First Edition. Bookplate of Roderick Terry. Sea story of the son of one of Salem’s most successful merchant mariners, brother of the US Secretary of the Navy, who had built an opulently-appointed ocean-going yacht for the sole purpose of rescuing Napoleon from St. Helena? This was the first American yacht to cross the Atlantic. A handsome volume from D.B. Updike’s Merrymount Press. Toy. Adventures Afloat: 156A Ferguson C.B. “The story, from beginning to end of an eccentric New England seafaring and mercantile family which produced two notable yachtsmen…” This is a documented, lively, readable, and indeed, sensational family history. Doctor. Checklist of the Merrymount Press. Issue #390 of the Press, the only printing. Morris and Howland. Yachting in America – A Bibliography. Page 37, one of “those relatively few books of particularly intrinsic worth,” in this subject area. See more of our inventory and learn more about purchasing from us by visiting our Current Inventory.